Let’s face it: the freight market is changing fast. Here at FreightWaves, we’re all about shedding light on a rapidly evolving industry, producing content and hosting events that enlighten, educate, and arm you with knowledge and resources to help you understand this competitive freight market. MarketWaves18 will focus on the freight market and economic outlooks going into 2019 and beyond. 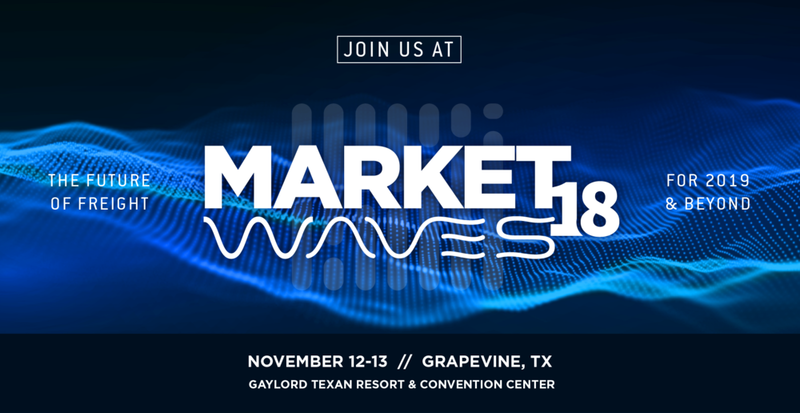 From November 12-13, 2018, FreightWaves will present MarketWaves18 in Grapevine, Texas. MarketWaves18 is designed to uncover the biggest disruptions impacting the freight markets, today and tomorrow. We’ll learn how to understand the metrics of the business from the Truckload Carriers Association’s Chris Henry, Morgan Stanley’s Ravi Shankar, and Echo’s Scott Friesen. Later, we’ll hear from Keep Truckin’s Shoaib Makani, DCS Advisory’s David Dolan, and Swan Leap’s Brad Hollister on the impact of technology on the freight market--and that’s only two of the dozen dynamic WavesTalks lined up for MarketWaves18. The best part? No slide decks allowed. Don’t just tell us how us how your product is posed to transform the industry—show us. This innovative format provides a proven platform for freight tech companies to achieve the next level of success with by giving them access to new customers, strategic partnerships, expert feedback, press coverage and VC funding. “We’re building off of the tremendous success we experienced with our groundbreaking demo day at Transparency18. The industry is clearly hungry for innovative and disruptive technologies that are helping to propel the freight market forward. We’ve opened up MarketWaves18 demo day to include more companies, while using with the same proven format,” said Fuller. “In the last few years, freight tech has become the hottest sector in the VC community. Because of the level of investment that’s been poured into this space, FreightWaves and our WavesEvents represent the intersection of innovative companies and ideas. With over 50 venture capitalists attending, MarketWaves18 is truly the epicenter of innovation,” Fuller concluded. Day two will kick off with a powerful conversation with Michael Lewis, the New York Times best-selling author of Moneyball, The Big Short, and The Blind Side, among many others. Lewis’ dedication to data makes him the perfect keynote speaker for this event. One of FreightWaves’ core missions is to bring transparency to freight markets by democratizing access to data—to give carriers, brokers, and shippers visibility so they can make better-informed business decisions. We think Lewis will do just that for attendees of MarketWaves18. Economist and author Jon Birger will also take the stage to tell us all about the ways that shifting dating and marriage trends are changing how the freight markets operate. Later, we’ll hear from Jason Schenker, President of Prestige Economics and leading economist, author, and market futurist, who will provide insight on manufacturing and risk in a time of uncertainty, focused on economic outlook and risk management within manufacturing, commodities, and freight futures.